AUDIO: Freelance journalist Wafaa Jamil speaks from Ramallah, West Bank about the lack of Palestinian interest in the U.S. elections. Peter Ford of The Christian Science Monitor speaks from Beijing about the China’s similar lack of interest and the absence of China as an issue in the U.S. elections. 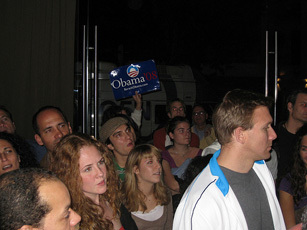 Argentinians watch the Oct. 2 debate between vice presidential contenders Sarah Palin and Joe Biden in Buenos Aires. At the second U.S. presidential debate on Oct. 7, candidates John McCain and Barack Obama discussed a range of foreign policy issues including their thoughts on Iraq, Afghanistan, Russia and Iran. Bloggers around the world watched and responded. From Canada, the “Mapleleafweb” blog argues that the focus on the economy in this debate will spill over into the upcoming Canadian election on Oct. 14. From Latin America, the “VivirLatino” blog writes that Obama won’t acknowledge immigration in the debates despite doing so frequently in Spanish-language ads. From Iraq, the “Iraq Pundit” blog points to changes in Obama’s position in Iraq based on his discussion of moral obligation during the debate. From Palestine, the “Body on the Line” blog writes that the debate ignored Palestine. And blogger “Jonolan” writes about which candidate would be better for Pakistan, concluding that McCain’s plan for a cooperative effort with the Pakistani government would help the country mitigate violence. Since the world has a stake in the outcome of the U.S. election, The Economist has created a global electoral college that allows people from all over the world to vote for one of the two main candidates. Currently, Barack Obama has received the majority of the over 25,000 votes that have been cast. Photo courtesy of Flickr user blmurch under a Creative Commons license. Am praying for Obama to make a big change in USA. An American bloc without its big players?